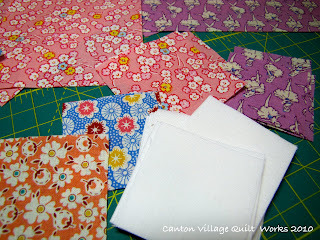 Canton Village Quilt Works | All Cut and Raring to Go! All Cut and Raring to Go! 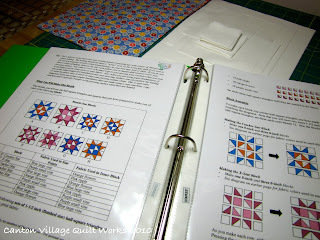 I began cutting out the first one of my Star Crazy BOM's. 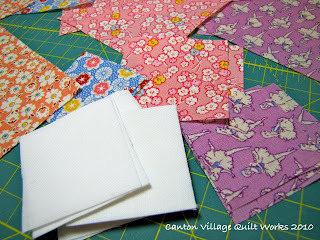 Yes, the first one is going to be made with 1930's repro fabrics, which I just adore!! I know it is a big deviation from the what they are suggesting you use, but I don't always follow instructions. Not that I don't want to follow them, but I really enjoy experimenting with different color ways and it also gives me a great opportunity to use my stash fabrics. I plan on making this one very scrappy. So each month you will not see these same fabrics above. There will be different purples, pinks, blues, and oranges. I really want to give it that "old fashioned" feel. 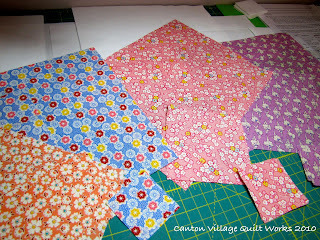 I love the sample that they made up very much and I am going to do my own take on the bright quilt. That is why I am making two. But you will have to wait just a little while longer to see that one, because I am waiting on the background fabric. It is on order. I will most likely cut out the brights over the weekend. Don't forget to go over to Nedra's if you want to join us in making this BOM. We have quite a few people. The more the merrier! Just a reminder today is the last day of the sale and giveaway on my online fabric store! Get your 20% off before it is too late by using the code new2010.